There is no one size fit all solution to lose weight. 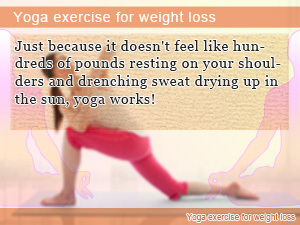 Much like yoga pants, the number of ways you can slim down is limitless including yoga exercise for weight loss. Yoga exercise may seem like more than you are willing to through down for weight loss especially when just getting started out but it turns out to be easier than you think. For low-intensity aerobic exercise with benefits that don't fail to show, yoga for exercise may be your chance to exercise at home. Is yoga enough exercise to lose weight and slow down the effects of aging? When blemishes and wrinkles threaten to ruin your skin, anti-aging becomes more and more important. While skin care products only cover your skin hiding what lies under the surface, eating a healthy diet and regular Yoga Exercise may help you feel younger giving you a deep lifelong health perspective. Yoga for exercise comes with antiaging that may be just what you need to start feeling younger or otherwise keep your youth where you want it to be. Taking up beauty protecting yoga exercise to restore you youthful image may be the best thing yet. In this diet Slism, we jump into yoga exercise discussing ways that you can take on yoga for exercise whether you join a class or just want to take it easy at home going at your pace. Have you ever wondered why so many women are doing yoga nowadays? - It may seem strange at first, but once you know how good it is for your body you will see why. Yoga has been practice in India since ancient times, which is where it gets its name, yoga. 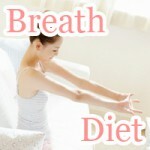 Yoga for exercise, disciplinary practice, and meditation purposes are all part of the yoga diet scene. Like any other exercise, every yoga pose has an intended purpose. Each yoga pose is a key to unlock weight loss and self-gratification where you want it. The reason why so many people are turning to yoga for weight loss is the fact that it works. When you are just starting to learn yoga for your diet or based on personal interest, there are countless numbers of people who have found the transformation of yoga irreplaceable after getting started. Here are some of ways to get started on yoga exercise. Doing yoga exercise at home may not be the space and concentration bargain that you signed up for. Where yoga class like other forms of group fitness pull their weight is in the environment that they create making it easier to go through the motion so you don't have to feel like you're forcing it. Time spent commuting to yoga class is time that you could be doing other things such as your hobbies. The reality of taking up yoga for exercise is that even though you want to start doing yoga, not everyone wants to dress down and be forced into positions you would otherwise not find comfortable. Even if you are thinking your body still stiff and there is no way you are going to do the amount of stretching required by yoga, like as forms of diet and exercise it doesn't make sense to give up before even taking the effort to try it out. Despite the image it gives off, yoga exercise has nothing to do with how limber your body is. No matter what your physical disposition is, yoga is for everyone! - For people less inclined to stretching, yoga is said to be just what you need to bring flexibility back to your body. The benefit of yoga is not limited to the flexibility you gain by practicing yoga. 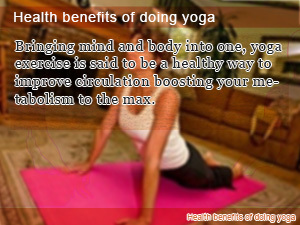 In addition to helping you get more flexible, yoga is said to be beneficial to your health. Yoga breathing techniques and poses help remedy bones and joint problems, improve blood circulation, as well as promote self-healing by your body. In recent years, more and more women begin to worry about sensitivity to the cold. Even in men, being sensitive to cold can be an issue at home or in the office at work. For people who work behind the desk, on a computer, or otherwise typing, trying to stay active is an ongoing issue. Doing yoga or when you do abdominal breathing exercise regularly is said to strengthen the renewal metabolism, or capacity for self-renewal, said to help dampen the effects of cold sensitivity. Improved blood circulation is said to help flush out toxins built up in your lower body giving you exactly what you need to detox your body. In particular, a strong renewal metabolism may cause sweating that you know has a natural cleansing effect lifting potentially harmful toxins out from your pours and away from bottlenecks such as your toes. Yoga is said to be good for promoting healthy joints with rotation as well as internal organ functionality that will take you for in lifelong health. Although there is a weight loss side to doing yoga, most of what you get out is a healthy lifestyle in an easy way to lose weight. Once you get in the hang of yoga exercise, it is said to be a fun way to spend your time exercising alleviated any worries of gaining weight. However, just because doing yoga is good for you doesn't mean you spend the whole day doing yoga exercise for weight loss. Like any other exercise routine, your body needs time to adjust. That is to say that it is better not to overdo it, always making time for much needed breaks from your routine. For people having trouble focusing while doing yoga exercise, listening to music spending time with your playlist, watching TV catching up on favorite shows, or combining exercise with aroma oil treatment may be just the change in environment you need to relax while you exercise. When doing yoga at home, always make sure that the room you are exercising in is well ventilated. All it takes is opening a window are allowing air to flow freely. This in itself makes a big difference in the aerobic exercise atmosphere you give yourself. As you move forward in yoga exercise, it may be time to start thinking about time to yoga up your exercise gear, possibly getting a yoga mat or even a pair of sporting yoga pants. Just because it doesn't feel like hundreds of pounds resting on your shoulders and drenching sweat drying up in the sun, yoga works! Bringing mind and body into one, yoga exercise is said to be a healthy way to improve circulation boosting your metabolism to the max. Finding antiaging is not easy. Some say the secret is in how young you feel. On top of heating a healthy diet, you don't want to be without yoga.